We got to talk to Andy’s Channel Ladies about their upcoming 3 way channel swim. 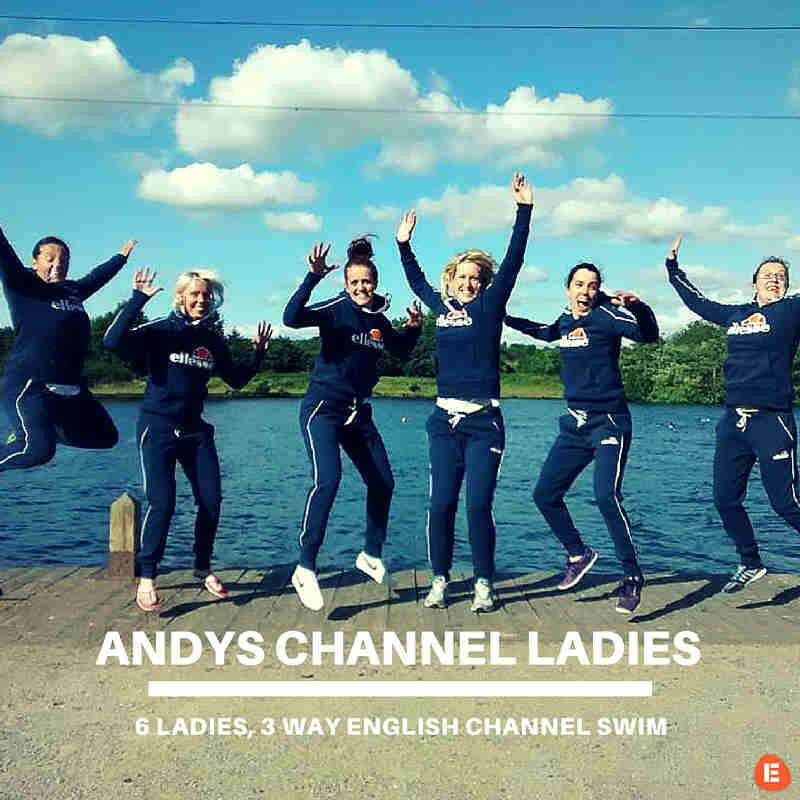 In 2013, Andy’s Channel Ladies smashed the World Record for the fastest two way crossing of the Channel, completing the swim in 18 hours and 13 minutes, a record they still hold to this day. This time, they want to go one step further and break the three way World Record too, which currently stands at 30 hours and 31 minutes! They will swim from England – France, back to England and then back to France where they will finally finish. Each team member will swim for one hour, then rest for 5 hours on the boat whilst the rest of the team complete their one hour swims. They will repeat this, keeping the same order until we finish. When they reach France and Dover, the team member in the water will climb out on dry land, clear the water and start swimming back again. So how about we get to know the team members? Check out some of their achievements below! Dee has successfully completed a solo Channel swim. She has also completed Loch Lomond, Loch Ness and Windermere 2 way (21 miles). In 2009 Dee had a stroke and was found to have a hole in her heart. 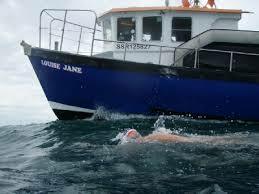 She was unable to compete that year but helped train her sister for a successful 2 way Channel swim. Dee had a heart operation that year and made a speedy recovery – in 2011 she was part of a Windermere ’12 way’ relay team that broke the World Record for the longest ever fresh water swim, completing in 75hrs 32 mins. Lucy is a swimming teacher and coach. In 2012 she was part of a number of masters relay teams in the pool, breaking several World Records. She currently holds the masters British Record for 200m butterfly in her age group. Lucy has won a bronze medal in the World Masters Championships and was No.1 in the masters FINA World rankings for butterfly in 2013 and 2014. 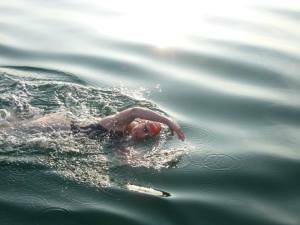 She also completed 3 miles butterfly in an open water race in the Liverpool docks as a unique challenge! Katie currently holds the masters British Record for 100m backstroke, and won two Gold medals at the masters World Championships in Gothenburg 2010 and Italy 2012 as well as silver and bronze. She qualified for the 2010 Commonwealth and 2012 London Olympic Trials, narrowly missing qualifying for the final by 0.2 seconds. Katie has swum the length of Coniston and Wastwater, and completed her first open water 10k in 2012. Natalie comes from a sporting background, her mother completed a Channel relay and her brother competed to National level in Judo. She has been coached by her father since the age of 12, and from 2009 to 2012 was part of the Paralympics GB team (S14 category) representing the UK in many International competitions. She currently holds Paralympic World Records in both the 400m freestyle and 100m Individual Medley. She has won Gold, Silver and Bronze medals in the European Championships. Natalie has represented GB in 2 World Championships and also the London 2012 Paralympics! Emma has completed a number of open water swims including Loch Rannoch (15km), The Solent, the Firth of Forth and Lochore Meadows. 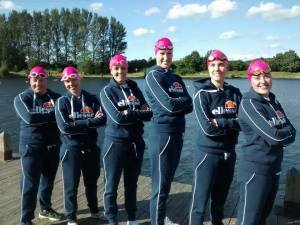 Last year she was a member of a 6 person team that took part in the ‘Channel swim in Manchester’ event, held at Salford Quays. The team shared the 36km distance, starting at midnight and swam through the night which was good practice for our swim in August! Emma won four bronze medals in the masters European Championships in the Ukraine in 2011. She has also been part of a number of masters relay teams who have broken European and World records. So how did you all meet and decide that you were going to do your first challenge in 2013? One of our team members (Jane) knew Andy King our boat pilot (as she’d done her solo channel crossing with him) he mentioned to her that he wanted to put a fast team of women together to have a go at breaking the double channel crossing world record, and raise money for the BHF. I knew her from training in the Liverpool docks, and she asked me if I’d like to be part of the team, and between us we asked 4 other quick girls we knew! Tell us how you got the name ‘Andy’s Channel Ladies’, who is Andy and what does he have to do with your challenge? Andy King is our support boat pilot, we called ourselves after him and the name stuck so we’ve used it this year too! Can you tell us about the two charities that you are swimming for and your reasons for choosing these? We are swimming for the BHF, as Andy the pilot had heart problems a few years back and it’s a cause very close to him (we raised over £5000 for them in our 2013 swim) and two of our team, Jane and Dee have had heart problems and were told they would never reach their potential in any sport. How wrong the Doctors were! We are also raising money for UNICEF this time as team member Jane is an ambassador for the charity, she was sent to Papua New Guinea with actress Keeley Hawes to see the fantastic work they do first hand. Jane was part of the opening ceremony at the Glasgow 2014 Commonwealth Games representing UNICEF and introducing the teams into the stadium.Where do people go to make a donation? Where can we go to make a donation? We are over the £1000 mark now which is great, and we hope to smash it! We’ve had to raise £7000 just to take part in this challenge so we’ve been busy fundraising in various ways over the last few months. As we can see from above, you are all elite athletes. Can you give us a glimpse into a typical day for Andy’s Channel Ladies? We all swim at a very high level, some of us internationally but we aren’t classed as elite athletes, we all work full time and fund ourselves to train, race and do these mad challenges! Amongst us we have a maths teacher, a fashion designer, a couple of Sales reps, a swimming teacher and a store assistant. A typical day for us is always a busy one, sometimes the day will start at 5am with a swim before work, then after work a trip to do a training session in a local lake/ river/ dock. We fit in meal times around this then off to bed before we do it all again the next day! You must have to train a great deal for this challenge. You must have had to train a great deal for this challenge. Do you train as a team or individually? What have been some of the biggest hurdles that you have had to overcome in training? Some of us train together, however we are quite spread out in the North of England, 4 of us live in Manchester and Liverpool and 2 in Yorkshire so it’s quite rare we are all in the same place at the same time! We are doing a night time training session tomorrow in the Lake District, to get used to swimming in total darkness and most of us will be attending that. Channel swimming rules mean no wetsuits are allowed to be worn on our swim, so for the last few months we have been training outside in costumes (since April). Due to it being a long winter and a rainy spring, water temperatures were well below average and still down in single figures when we were starting to do acclimatisation swims to get our bodies used to such cold water. It was very tough but we pushed on and got there in the end! Some of us train in the Liverpool docks which are full of jellyfish so that’s definitely helped us get used to them a bit, though we still hate the stinging ones in the Channel! What makes you most nervous about your upcoming challenge? We’re most apprehensive about stinging jellyfish, swimming in total darkness, sea sickness and of course none of us want to fail! We are setting out with every intention of breaking the World Record, we’re prepared and ready but there is quite a large element of luck involved with the weather and sea conditions being so unpredictable. We are all busy praying to the weather gods! What is in store next for Andy’s Channel Ladies after this challenge? What’s in store for us after this? Definitely not a 4 way crossing that’s for sure! After our two way World record in 2013 we said we wouldn’t do another crazy challenge and here we are doing an even bigger one, so who knows. We don’t have anything planned but never say never, who knows what could be next! Andy’s Channel Ladies are looking to break a world record in their upcoming challenge and do something that has never been done before. Show some support for their amazing challenge and visit their fundraising page here and get behind this amazing group. You can find them on Twitter and Facebook to keep up with everything they are doing and to let them know we are behind them!